I just recently picked up this card. 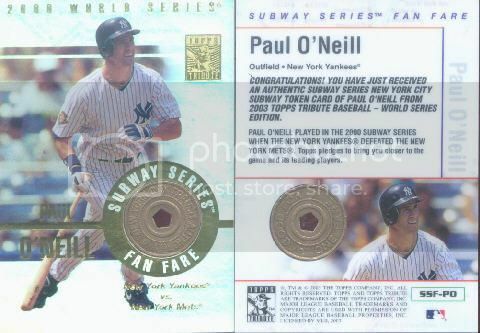 The owner had it listed as a "Promo" "changes on back"
It is a 1995 Fleer #78 Paul O'neill. It looks as if the card back shows career high numbers within a box. 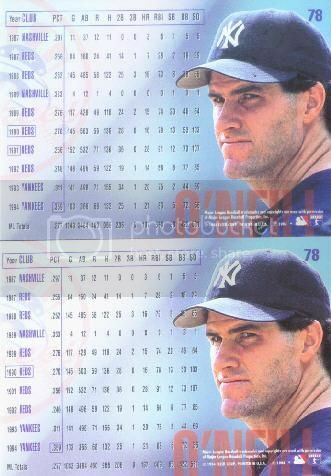 In this promo card 1991 is within a box but on the regular issue there is no box. I have a PSA 10 of the regular version also with no box. I went to my stack of doubles and I had copies of each. Is this an actual promo card or is it a corrected error? Does anyone know what these were or if other players were like this? @tpeichel any idea? 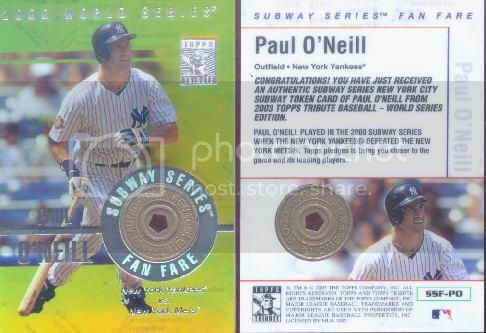 Next is a 2003 Topps Tribute Subway Series Fan Fare Token card of O'neill. Beckett lists just one. No parallels that I am aware of. Well I got this card in a collection. Looks to be a gold parallel of the same card. The back is identical. Anyone know what this can be? Thanks in advance for any help with these, Kevin in CT. I thought the gold was 1/1? Should be the base (top one), one with red logo /50 and the gold one. Maybe I'm thinking different year? Beckett only lists 1 card for these Fan Fare Token cards. Im not sure what I have here. It's from the set of unmarked promos. It is not a pack-issued error card. There are 9 or 10 players including Juan Gonzalez and Ozzie Smith. What exactly do you mean by unmarked? Just not stated on the card itself?